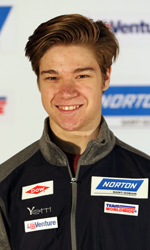 Sixteen year old US Performance Academy student, Sean Hollander, has been named to the USA Luge Junior National Team; an accomplishment that goes to only a few young athletes in the country. A promising young athlete, Hollander has had many notable results in his athletic career including the 2013 Norton Youth B National Championship Silver Medalist, the 2014 Norton Youth B National Champion, and 5th in the 2015 Norton Jr. National Championships. Most recently in the 2015-2016 season, Hollander placed 1st and 4th in the 2 Norton Youth A seeding races and was a Bronze medalist in the Norton Youth A National Championships. Being named to the USA Luge Junior National Team came as a result of his dedication and focus to the sport. He trains with the Junior National and National Team in the off season at the Olympic Training Center in Lake Placid, NY. During the summer, he trains at the Olympic Training Center and then heads out to winter races around the world in November. With the long training hours and unpredictable travel schedule, Hollander chose an alternative form of education to keep up with his studies. A junior at US Performance Academy, Hollander and his athlete colleagues are able to travel, train, and compete without missing classes or assignments. His school, US Performance Academy (USPA) is an independent, fully accredited, digital, middle and high school designed for the competitive young athlete. For the 2016-2017 seasons, Hollander will be racing with the Junior National Team around the world in locations such as Germany, Canada, and Latvia. To learn more about US Performance Academy, visit http://www.GoUSPA.org.